This is an English translation of the article, “In-Depth-Spieleranalyse: Manuel Neuer” by RM published at spielverlagerung.de. At the end of our Advent calendar, we take an in-depth look at Manuel Neuer – possibly the best goalkeeper of all time – as he (r)evolutionizes the position of the goalkeeper with his proactive approach. It is notable that out of all the possible candidates of the DFB-World Champions, only Manuel Neuer became one of the three finalists for the World Player of the Year. Philipp Lahm, who as captain led his national team to the title and showed outstanding performances as a No. 6 at the club level; Bastian Schweinsteiger, whose performance in the final remained most enduring in the minds of many; and Thomas Mueller, who once again for his club and country, and at a major tournament scored goals almost by himself – any of them would have deserved a nomination. Neuer has had a similar and perhaps even a bigger share in the achievements of Bayern and the German national team since 2012. It can be argued that Neuer, despite being a goalkeeper, has performed even more spectacularly than his teammates. Inspired by the fictional character “Manni, the Libero”, “Manu, the Libero” has been doing the rounds this year. Rarely has a term been more appropriate to describe the interpretation of a position and the role of a player. That is because Neuer plays almost like a sweeper, always staying a few meters behind the centerbacks, building up the game as the player in the deepest position, and safeguarding the spaces behind the defense. Some time ago, I wanted to write a longer article about the different playing styles of goalkeepers. My intention: distinguishing defensive and offensive tasks. Some goalkeepers are outstanding with their feet and in participating in the game, but when faced with deadly passes behind the defense by the opponent they either frequently stay on the line or in the penalty area, or don’t move far upfront in general. Others may be exceptional at intercepting passes but subsequently don’t know what to do with the ball because of their weak technique. Manuel Neuer falls into the last category like no other. Whether his team or the opponent is in possession, he is always ready. Neuer is actively involved in the game and tries to make as much impact as possible even in unobtrusive situations. Against SpVgg Greuther Fürth two years ago, a situation occurred in which Fürth played in a 4-5-1 formation with aggressive frontline pressure. As the ball came in from the right side to the central defenders and Boateng and Dante were briefly well marked, one could see Neuer running diagonally into the left half-space behind the centerbacks in the background. This is an unimposing action that ultimately does not play a big part in the overall picture of the game, and is only ever analyzed in all its consequences by a few. At the same time, this particular action is symbolic of Neuer’s strengths. His run in this situation indicates not only a pinch of madness and a dash of courage but also incredible game intelligence. A loss of possession by the central defenders in this situation might lead to a clear cut chance (called “big chances” on Opta) which would probably be a dribble to the goal or an attack with a combination of short passes. Neuer would have no chance even if he moved far out and would be put in a difficult 1-on-1 situation. Intead, Neuer wanted to prevent this situation in the first place. If Dante had been more attentive, he could have simply passed the ball to Neuer. Neuer was so far away that Fürth couldn’t pressure him or would have taken too long to pressure him. In the latter case, Neuer could have easily played a targeted long ball or could’ve waited for one of his teammates to run free. Bayern versus Leverkusen 2012 – 90:44. Faced with a possible counterattack, Neuer received the ball from his right back and immediately passes it with just one touch directly to Lahm. Neuer‘s free running movements are often of such a nature. From a strategic perspective, his movement when he offers himself as an available passing option is very intelligent for a goalkeeper in particular but also for a footballer in general. This is a frequently underestimated and incorrectly perceived characteristic of Neuer. Individual technique thrives on both individual and collective tactics. A player who looks around before receiving the ball, who moves away from the opponents into wide open spaces and properly moves towards the ball, will have less mistouches or turnovers when receiving a pass. Even a weak technician at a professional level can reasonably and effectively handle the ball in the absence of time, space and opposition pressure. A high game intelligence can compensate for weak technique. That is also true for group tactics. Correctly assessing running paths, game dynamics and movements prevents misplaced passes. Often it is not the passer who is at fault for a poorly received pass, even though they are usually the ones blamed. But what does that have to do with Manuel Neuer? At times, Neuer’s technique is examined through a magnifying glass, often too focused and isolated on detail, thus missing the bigger picture. In raving conversations about Neuer in pubs or on forums, one often hears that he could pass as a third division outfield professional in terms of individual quality. This fails to recognize that Neuer could most likely play on an even higher level than that. As Neuer’s tactical and strategic intelligence has to be classified significantly higher, he can use it to maximize his technical skills as well as make the impact of his actions even greater. In terms of solid passing technique and ball handling, Neuer perhaps isn‘t even in the top 5 of the world’s goalkeepers. With respect to pure technique, Marc-Andre ter Stegen, David de Gea, Nick Marsman, Manuel Riemann, Jasper Cillessen, Claudio Bravo, Juan Pablo Carrizo, Rogerio Ceni, Víctor Valdés, Beto, Rui Patricio, Yann Sommer, Fernando Muslera, Oliver Baumann, Ron-Robert Zieler, Gianluigi Buffon and Kenneth Vermeer are on similar level as Neuer. Ter Stegen, in particular, might have an even better passing technique while de Gea’s ball handling is probably better. Reina and Valdés are better overall technicians than Neuer. All things considered, Neuer is still the better footballer because he is (even) more intelligent and eager in providing himself as an open man for his teammates than his competitors. He is very adept at offering himself for a pass narrowly outside the box or finding positions inside the penalty area where he has many options to continue the play without coming under pressure. Bayern versus Chelsea 2013 – 117:25. Neuer intercepts a long ball and plays it towards the middle. His decision making also has outstanding effects in the passing game. Neuer’s immense contribution in the passing game is not only because he is a passing option in the deep build-up play but he also participates in the creation of the long-term course of attack. For example, Neuer likes to distribute diagonal long balls across the pitch into areas the opponent leaves open and they usually arrive accurately. If the opponent leaves certain spaces on the pitch wide open, as a Bayern fan, you can be sure that the attack will either be initiated by a direct long ball or an intelligent targeting of these spaces via short passes towards the open zones – thanks to Neuer. Neuer’s intelligence with respect to long balls is most noticeable under pressure. Often, he clears the ball seemingly messy and far up the pitch but these balls either go to open players or – probably even more often – simply into spaces where there are relatively many Bayern players nearby in principle. Dangerous counterattacks by the opponent after such balls rarely occur. Most of the time, Bayern can immediately organize defensively with more or less stable forward pressing and even successfully chase directly after the second ball. In the 2013 Champions League final, Neuer under pressure chested a difficult pass from Schweinsteiger and volleyed a long ball directly forward to Mandzukic. It resulted in the first goal by Bayern – and ultimately, the CL victory. Such long balls are, of course, rarely that effective but they almost always produce favourable results for Bayern. Although, Neuer’s long balls may not be as elegant as ter Stegen’s, they almost always arrive in the right places. Deutschland versus Italien 2012 – 92:54. Right in front of an Italian striker, Neuer intercepts a deadly chip attempt by Pirlo, and heads it forward against an approaching Italian defensive line. Hummels is narrowly offside. 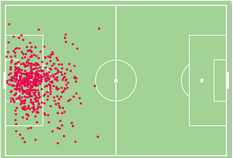 Additionally, Neuer is outstanding with flat passes. From a strategic perspective, he uses his deep position and the available pass angles in a most intelligent manner. Especially in build-up play, the goalkeeper has his own special role in the game. For example, a typical goalkeeper never needs to do complete full-turn of the body; the maximum is a 180 degree turn and even those almost never occur. In most cases, slightly tilting his viewing angle diagonally from one side to the other is enough to cover the full range of options. Furthermore, back passes to the goalkeeper are almost never blocked by any marking player, although some teams (most notably, Tuchel’s Mainz) have deliberately tried that in some games against FC Bayern. The goalkeeper is rarely pressured intensely and is arguably the only player in the team who is almost always the farthest away from compact and efficient pressuring of the opponent. Hence, a proactive goalkeeper is normally not afraid of immediate pressing, as he can run freely into spaces and after a back pass he has the entire pitch directly in front of him. Furthermore, another important tactical effect should be discussed. No goalkeeper in the world – not even Neuer – can participate in high pressing. In an aggressive pressingin the opponent’s penalty box even the central defenders are bound to stay near the halfway line. For instance, pressing in midfield may correspond to a compact block of ten players with 25 meters length to their goalkeeper. But in high pressing, when the opponent’s keeper is put under pressure as well, the length is almost always more than forty meters. As a result, there are two interesting aspects of a proactive goalkeeper: If the opponent is pressing high, a proactive goalkeeper automatically generates a numerical superiority in his own half because the opposing keeper cannot effectively directly engage in the pressing. Hence, it’s 11 against 10 or 10 against 8 (minus a high center forward who binds the two opposing central defenders in a hypothetical chain of four). This numerical superiority can be used to play forward and push back the opponent or to come up directly behind the opponent’s defense. Another aspect is the aforementioned lack of compactness, combined with the spaciousness brought by the opponent’s high pressing movements and a numerical superiority in the goalkeeper’s own half. In the first third of the pitch, the fullbacks and midfield can easily be integrated and the vast areas of space can be controlled by using only a few players. Hence, for an effective high pressing the opponent must either move extremely fast and intense or occupy more space in general. With a proactive goalkeeper, because of the numerical inferiority this style of play brings to the opponent, that it is easier said than done. If the goalkeeper is more involved in the game, there would always be free spaces and open players on the pitch. This example is of course somewhat simplified but it shows the possibilities a technically strong and proactive goalkeeper offers his team. This could also be practiced in a high goalkeeper chain similar to Higuita’s,though it would probably be somewhat more unstable in such a case. When the opponent is pressing high, Neuer mostly concentrates on the spaces in his own penalty area, or otherwise pushes forward from about 20 meters distance behind the centerbacks. Thus, Neuer is positioned near the center circle in a deep pressing defense by the opponent, while in a midfield pressing, Neuer occupies the space just outside his penalty area and conducts himself as a permanent open man. Bayern versus Chelsea 2013 – 120:01. Neuer grabs the ball and urges to continue the play immediately. Dante is positioned a little deeper, he switches a bit slower than the goalkeeper. As a result, Neuer always has the pitch wide in front of him and after receiving the ball he almost always uses small twists to play it right to the other side, thus minimizing any loss in the momentum of the play. Accordingly, he can change his entire field of view and play the ball into remote spaces. For a proactive goalkeeper and for Manuel Neuer, this may be the key point in the build-up play. Against compact and intensely ball oriented shifting opponents, it’s a very difficult task to switch sides using several flat passes, and long balls are risky and difficult to handle. If the opposition team is compact and intense, it can exert pressure in any position. Passing back to the centerbacks either causes a loss of space or it may put the central defenders as the last men under a great deal of pressure. Hence, the entire team has to track back a bit. At the highest level, quick combinations into remote open spaces right through the opponent’s block are rarely successful. That likelihood increases with Neuer. For one thing, the central defenders can position themselves wider and cut the link between each other, because Neuer is always there and he moves up along with them and serves as an open man for redirecting the ball. As a result, shifts from one central defender to another can be more spacious and the defenders are harder to pressure. Also, Neuer can initiate outstanding shifts sides from his deep position. The opponent can’t get a hold of him, he doesn’t even really have to turn around and he is a very capable passer. 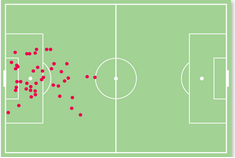 For example, Neuer prefers to play passes towards the far side of the pitch, thereby skipping the central defenders. He doesn’t only do that when he is shifting the play, but also in the general build-up play when the opponent leaves these spaces open for the fullbacks, or if the wingers can’t intercept those passes because of the ball oriented movement. The “skipping of the centerbacks” using long and mostly flat passes also fits surprisingly well into Guardiola’s ideas of the game. Bayern versus Leverkusen 2012 – 92:20. Leverkusen tries to secure the win by parking the bus. Neuer plays a long pass to the open left wing, right into the path of a Bayern player. The fundamental goal – as I clarified in a Twitter discussion with Enric Soriano – is to create advantages through numerical superiority in positional play / El Juego de Posicion when occupying and advancing into open spaces. This can be done by a variety of mechanisms and following basic principles and specific concepts. An in-depth analysis of Guardiola’s positional play / El Juego de Posicion is found here. Under Guardiola, but even before him, Neuer’s passing game has been based on these guidelines. Passes towards a fullback who is faraway from the ball while skipping the central defender is already part of his game. These passes are played in a variety of ways and that includes delivering the pass with respect to the field of view of his other teammates. In situations where Neuer cannot pass the ball into the running path of a player, he plays a sharp ball aimed somewhere behind the back of the player. The receiver won’t be able to move forward, but would let the ball bounce as quickly as possible onto another player behind him and then that player has the game in front of him and has the flexibility to build up the play. Bayern uses this practice to free themselves from pressure and either advance forward with a fullback or a winger, or give a central defender time to move towards the wing and fill the fullback’s space. However, if it is possible to pass the ball into the running path of a player who can then move forward immediately, Neuer has mastered the decision making at a high level and can use both his feet, even if his left foot is slightly weaker. Ability to read the strategic shifts in the game is important. When passing options can be chosen freely and there are multiple passing options, more caution is needed than when high quality and precise passes into more compact central areas is required. But even in pressured situations Neuer is convincing – he doesn’t always rely on easy passes to the central defenders or use the (intelligent) long ball. For example in some situations, Neuer can use the aforementioned numerical superiority when the opponent is aggressively pressing high. He then frequently bypasses the central defenders and passes into the defensive half-spaces where the No. 6, or No. 8, or a fullback who has moved inwards is positioned. Or, he can play a Jerome Boateng-like through-ball between the opponent’s central defenders. This allows Bayern numerous opportunities for their build-up play. Neuer can serve as a simple passing option and he can pass into appropriate zones or play long balls towards open attacking players. He also functions as a safe and permanent option for back passes where he can opt to shift the game to either side, and he can be involved in shaping the game from the back. If the opponent pressures him and his nearest open teammates out of the game, Neuer can suddenly deliver a flat 40-yard pass to a free Bayern player far behind the opponent’s first pressing line. Neuer seems to intuitively play according to the following principles: If there’s no rhythm to the play, find a way to create it. If the rhythm of the game is established, try to maintain it by all means. This explains his calm, patient, and long-term oriented decision-making in difficult build-up situations, as well as his situational attacking of space with passes like his long balls or his attempts at immediately initiating attacks after intercepting the ball. There is good reason why Neuer has the best pass accuracy amongst all goalkeepers. About a year ago, I compared his passing statistics with the other Bundesliga goalkeepers and no one was anywhere near Neuer – be it short passes or long passes – on total number of passes and success rate. Of course, this is slightly misrepresented because of Guardiola’s philosophy; for this reason, I compared Neuer with a handful of selected goalkeepers. His precision does not only show in the passes with his feet or interceptions of deadly passes by the opponent (or slide tackles like against Algeria and Augsburg), but also in other situations as well as when using his hands. Bayern versus Chelsea 2013 – 118:57. You’d like a bit of a high Torwartkette (“Goalkeeper chain”)? But why won’t the central defenderfan out wider and open space? Why? ¿Por qué? Sometimes, it is a pity that Neuer plays short goal kicks. In the past, he had some very interesting long balls from goal kicks directly into the path of a forward especially with the DFB-XI (like his fine assist in Klose‘s goal against England in the 2010 World Cup) and with Schalke. Many of them, obviously, weren’t accurate enough or simply lost in congested spaces – as it is usually the case with goal kicks. Both teams are positioned in compact clusters usually slightly sideways near the halfway line, thus the goalkeeper can often only play a punt into a congested area, hoping his teammates can get hold of the second ball. But Neuer has exploited that in various situations, like when the opponents were badly positioned because one part of their team pushed into the space where Neuer’s teammates had gathered, while the rest of them didn’t secure the vacated zone tightly enough. As a result, gaps were opened in the middle and Neuer was able to hit the ball through them to either push the opponent back or to create a direct goal scoring opportunity for his teammates who managed to breakaway. Such actions occur sporadically though. Neuer’s throws following set pieces, intercepted crosses, or directly after he catches a shot by an opponent are much more interesting. They often serve as an excellent start for counterattacks. Guardiola has already put that to use during this season and even the previous one by not involving two to four players in defensive tasks but allowing them to gamble high up the pitch. Players who are fast albeit weak in the air like Robben and Ribery, are waiting up front and try to draw opposition players towards them. And if that does not work, both are free for Neuer to aim a throw immediately after an intercepted cross. These throws are also used frequently when a counterattack is not possible for the purpose of gaining space up front. Usually after an attempt on goal or a set piece, the opposition team remains high and disorganized on the pitch. At the same time, the team’s own formation is rarely ready for a perfect counter. But often there are open spaces between the opponent’s defensive and attacking lines. A precisely thrown ball into these spaces by Neuer will force the opponents to immediately reposition themselves and retreat. Tracking back from bad (and disadvantageous) positions is not only more difficult to execute (as it requires additional turns and repositioning) but also a challenge psychologically – everyone wants to be involved when a goal is scored, and attacking is more fun than defending and tracking back, especially when responsibilities are unclear. Every coach (especially of a youth team) knows that offensive combination mostly works more dynamically and collectively. This is one reason Neuer’s precise throws or passes to restart attack can be effective. Bayern versus Leverkusen 2012 – 92:54. Out of the way, Neuer’s here. This was too colourful for even Bizarro and his header only managed to hit the bar. There are also tactical aspects to this. While in attack, as long as the team can keep the ball they have freedom. And on the break, the aim is for a fast counter anyway. But when the flow of the game switches, i.e. from attacking phase to defending phase and the team is caught badly positioned, confusion arises – who should pressure the ball carrier, whether to man-mark, how to reorient the team, who goes back to his position, who moves forward, should the attack be redirected, speeded up or intercepted? Neuer’s fast throws following intercepted crosses (where there are wide open spaces on the wings) or set pieces (where defenders are often upfront, strikers or attacking midfielders are assigned defensive duties, and the fullbacks are often in positioned in the center) often target open spaces and force opponents to quickly cover more ground in defense as well as make complex decisions. Otherwise, if there are no direct opportunities for a counterattack, Bayern can advance forward and let the ball move to push the opponent back and initiate a new and stable ball circulation against a disorganized opposition who is reorienting their positions for defending. This combination also allows Bayern to maintain the momentum. After an (attempted) shot on goal, the opponents are usually positioned far up front and close to the defensive line, thus calm and secure build-up play is not possible immediately. A normal goalkeeper then sometimes kicks the ball forward to a target player, but most of the times he just waits. As a result, the potential advantage of playing against a disorganized opponent is lost, because the team wastes time organizing itself to face an organized opponent. Thanks to Neuer, Bayern immediately bridges the blocked spaces and often integrate their own process of organizing themselves into such a sequence, while the opponent is caught off-guard and can’t immediately reorganize their formation, because Bayern can circulate the ball and maintain the momentum of the game. This is an unusual and often an unappreciated strength of Neuer – throws are mostly deemed effective only when they initiate a counter, but not when they prolong disorder in the opponent’s formation. In addition to the intelligence and the strategic effects of these throws, it’s their range – and not their final consequence – that is probably most impressive. Neuer can comfortably throw the ball over a distance of more than 50 meters with incredible accuracy. How he has trained that at this level – and how he sometimes manages to throw precisely to a distant player immediately after having intercepted a ball – remains unclear to me. But the technique he employs shows his use of his long arms and body to generate great momentum and give the ball immense speed. He often falls over immediately or lets his arm swing off as he releases the ball at the point with the strongest momentum, which apparently catapults it to the opposition’s half. Goal kicks and throws are two devices Neuer uses to bridge wide spaces over the heads of the opponents and cause them rather unusual problems. The consequences of his offensive clearances in front of his goal are another equally underestimated aspect of Neuer’s game. No goalkeeper covers anywhere near the amount of space with as much consistency as Manuel Neuer. Some passes by the opponent behind the defense are already intercepted near the halfway line; in some cases he even slide tackles threats on the wings like against Algeria or Augsburg. It is striking that in some situations Neuer takes great risks, because he aggressively approaches the player about to receive the pass. With passes into the half-spaces or towards the wings that is not a big problem; Neuer can approach the ball sideways, place it over, or simply dribble past the opponent. He doesn’t need to shy away either and can run at top speed from beginning to end. However, if passes reach him vertically and an opposing attacker is running behind the ball, sometimes Neuer has problems securing the ball immediately and delivering a pass to one of his teammates – as you can see, we are criticizing here at the highest level. This, however, is not a problem about technique for Neuer but a physical one. If he runs diagonally towards the ball and the opponent does the same, it’s merely a question of who gets there first. If it’s the opponent who gets to the ball first, he can run past Neuer, but he is still far away from the goal. But thanks to Neuer’s very good anticipation, the opponent is usually barely ahead – if at all – and won’t be able to slow down. As a result, he either has to knock the ball relatively far ahead and finish at top speed from a position not much closer to the goal, or he needs to control the ball in a sophisticated manner. Neuer can then reposition himself without exposing a better shooting angle for the opponent. In the meantime, Neuer and his teammates can track back and make life difficult for the opponent. Most of the time though Neuer reaches the ball first or at the same time as the opponent. He can then pass into open spaces, because Bayern’s opponents are rarely counterattacking with superior numbers and appropriately positioned on the wings. If they make contact with Neuer, he’s usually awarded the free kick; admittedly, this is not justified in some cases. If Neuer approaches the ball vertically at top speed, there would be bigger problems. In this situation, Neuer would have to slow down, otherwise he will risk crashing into the opponent at top speed; a rather suboptimal result being the last man – and also unhealthy. Dodging the opponent in front of him at that speed is also difficult. Thus, he often slide tackles a few meters ahead so he can slow down before he’s about to make contact with an opponent, and then clears the ball for a throw-in far away from his goal. Neuer‘s direct passes up front and to the players around him (often the No 6 and the centerbacks chasing the opponent) or his dribbling past the opponents have become highlights in every game where they occur. They are also effective: Counterattacking after a counterattack attempt by the opponent is dangerous. In these situations, Neuer leaves the opposing strikers behind him. This allows not only counterattacks with a short-term numerical superiority but also a skillful and calm build-up play against an opponent who is in a more passive role for the time being. While he cannot always clear the situation as cleanly as it is possible in the cases where he is running diagonally or faced with a diagonal pass by an opponent, slide-tackling accomplishes the most important task: preventing a goal. Regardless of whether he clears the ball or continues playing it, Neuer’s timing in such duels has become so absurdly precise that in his umpteen forays out of his box in recent months, he hasn’t made one error worth mentioning. There have been close situations, but even with one or two goals conceded Neuer’s success rate would be above average. In fact, Neuer’s greatest strength aside from preventing scoring opportunities is thwarting clear cut chances. Hypothetical question: How many 100% scoring chances has Manuel Neuer intercepted with his extremely proactive and (allegedly) high-risk goalkeeping even before they materialized? In the past three years? Fifteen? Twenty-five? Fifty? Granted, I have no idea and there are no statistics on this. But we have to assume that there have been quite a few. How many goals has he conceded because he was chipped from a distance or because an attempted clearance went wrong? One? Five? As a Bayern fan, I can’t remember any since Dejan Stankovic in an Inter-shirt, volleyed Neuer’s defensive header to score against Schalke from the halfway line. Deutschland versus Italien 2012 – 92:47. Couterattack? Over my dead covering shadow only! Neuer advancing into open spaces prevents many clear-cut chances for the opponent, and in a very few cases allows the opponent to finish on an empty net – in a difficult situation with a great distance. Finishing under pressure and after a sprint from twenty meters behind the halfway line and scoring a goal with full force isn’t as easy as the empty goal makes it seem to be. For this reason, Neuer accepts the risks involved losing control and abandoning his goal to prevent the major clear-cut chances. The advantageous tactical consequences are another benefit of course; the defenders can stay higher on the pitch, the team can press more aggressively and often Bayern’s central defenders advance further up the pitch to exert enormous pressure to the opposition, since direct long balls can be intercepted by Neuer anyway. Neuer does not necessarily look like a duck, but like the supplest Ikea cabinet in the world, but he also pursues the game in a similar manner. He is constantly ready to start a sprint, always keeping the appropriate distance. He does not only position himself according to his team’s formation and the ball’s position, but he also interprets the opponent’s eye and body movements. If Neuer sees that the opponent realizes his high position and prepares for a long shot, he either stops moving forward or slowly starts orienting himself backward, sprinting back to his goal if necessary. 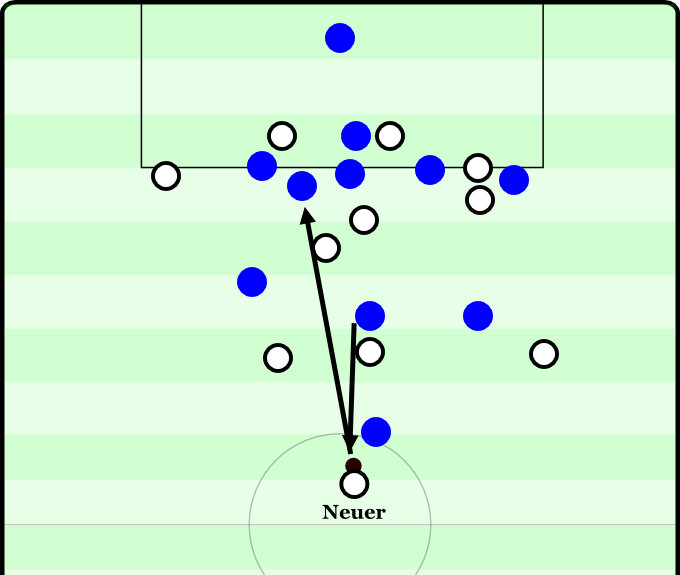 If, however, the opponent’s ball carrier doesn’t realize this or is under pressure further upfield, Neuer remains in his high position, and even starts looking for available passing options for the opponent’s ball carrier, considering his field of view, the specific pressure he is under, and the open men available. Thus in addition to his consistency in positioning himself optimally relative to what’s happening on the pitch, Neuer also has a small speed advantage. He doesn’t have to turn around and he can immediately start off at top speed, because there’s no opponent pressuring him and he can simply run forward (whether straight or diagonally). His rapid forays outside the box sometimes look spectacular because Neuer, being a goalkeeper, simply looks faster than many of his teammates in front of him (Mertesacker and Hummels for example); although he obviously enjoys an unfair advantage as a result of his free position and faster block starts – an advantage he exploits excellently. Neuer‘s forays outside the box work so well because he prevents most goal-scoring opportunities before they even materialize. But if the opponent – by any means – reaches Bayern’s goal, Neuer is still one of the best goalkeepers in the world. Because he is not only convincing outside the box but also inside the box. At least that’s what the number’s suggest. A lot of players experience difficulty in 1-on-1 situations against Neuer. Recently, I saw a statistic – that I unfortunately can’t find anymore – stating that Neuer allows the fewest 100% opportunities (“big chances” at Opta) in Europe and is among the top 5 goalkeepers when it comes to foiling these major opportunities. In the Bundesliga, he faces the lowest percentage of shots, but that only partly explains his outstanding results with respect to goals conceded. According toWhoSchored’s data (with some additional calculations), we learn that Neuer has faced a greater than average percentage of good goalscoring opportunities by the opponent (shots within the six yard box or the penalty area) in recent years. While this is only a glimpse when measuring the quality of chances (other factors like pressure by the defenders, type of pass, type of shot, etc. would have to be considered as well), it shows that Neuer does not just fend off easy shots from a distance once in a blue moon.In his 2010/2011 season at Schalke, he even faced more shots on goal inside the penalty area than the league average (2.1 vs 1.8). But how does Neuer fare in regards to good goalscoring opportunities saved, compared to the average in the Top 5 leagues? Michael Caley (or Devin Pleuler), for example, has a reachedcontrasting conclusionagainst the random variation in converting goal scoring opportunities; using aggregate data, they concluded that ‘players with exceptional finishing skill will perform better than the average – but sometimes lucky – counterparts.’ And Opta Sports Austria’s chief editor Phillip Ertl kindly informed me on Twitter that in the second Austrian league, the average save percentage is almost 72%. These differences can be explained by more precise ExpG models of course, (here areone, two, three, four, orfive explanations of the concept), but perhaps not all of it. Because of the statistical evidence, some avoid the pure random distribution of chance conversion rates, others avoid dependency of chance conversion rates on ability and form, still others (like Martin Rafelt and myself) consider a mix of these points important: football tactics and psychology, ExpG model problems, missing parameters in data collection (like the amount of space and time pressure an opponent experiences in decision making), aspects of strategic timing, exceptional finishing skill expertise, team and league effects, as well as chance and the special manner opportunities in football arise. Another one is the goalkeeper. Despite all these measurement problems, I thought it would be interesting in the course of this analysis to compare Neuer’s save percentage against the average. Besides, based purely on shot distance, percentages are more unfavorable rather than favorable for him, and Neuer has played under different defensive schemes: at a team with deeper defense (Schalke), at a team focused on midfield pressing (Heynckes’ Bayern) and at a team with an extremely high defense (Guardiola’s Bayern). So what are the numbers? According to data published by “Der Spiegel” for this season, Neuer has an 89% saves percentage, but while that is outstanding, it is of course only based on a small sample size. Neuer was above the average of 68.5% every single time over the past six years. In the past three seasons, he was even significantly above the average and has improved every year. Even though it’ll be hard to keep the current percentage up, these are obviously very strong results. As already mentioned however, this doesn’t give a full picture even if the shooting position is considered, because aforementioned factors comes into play. That’s why the data provided by the great Michael Caley from his ExpG model is possibly the most accurate on the internet. How does Bayern compare with other European clubs? Goals against from Expected Goals aka Expected Goals Against (ExpGA). Data from 2013/14 season in the Italian, Spanish, and German league. Bayern’s ExpGA is at a Z-score of around -2. This is an outstanding value.Roma, with their very peculiar defensive mechanism, also have a comparably good value.Juventus is just behind with Buffon and the triple chain – and possibly there’s an Italian bias playing a role here.Levante have blocked many shots with their compact and aggressive defense and add to that, Keylor Navas – an absolute world-class goalkeeper in terms of shot-stopping. Only the results of these three teams and Bayern are statistically significant in this direction from the chart above. But is this season just a one-time outlier? Or does it, as one might expect, depend on the team? Caley’s data allow us to further investigate and follow Neuer over several seasons as well as with the two teams he has played in since 2009. Here we see Shot xGA (Expected Goals from all shots), SoT xGA (Expected Goals from shots on target – almost identical values), and NPGA (number of goals conceded excluding penalties) per season. In the chart above, we are presented with an overview of the 2009-2014 seasons of Schalke and Bayern in Caley’s database. It is already noticeable that Bayern couldn’t outperform the Expected Goals model without Neuer, but Schalke with Neuer could. After Neuer moved to Bayern, the trend changed, even if in the present season Schalke perform quite well (probably because of the small sample size and team effects, buts also possibly because of their goalkeeper Fährmann). How exactly does this difference look like, though? Neuer’s Expected Goals Conceded (all and on target shots) for both teams and the Actual Goals Conceded without penalties compared with the goalkeepers before and after his time at Schalke and Bayern. Neuer has already outperformed the model at Schalke, but the same is not true for Schalke after he left. Instead, they conceded the same number of goals as predicted by Expected Goals from all shots. At Bayern, the Neuer effect is even more extreme. But, how clearly does Neuer outperform the model? And how close to the model are the teams without Neuer? A simple formula will help. I have divided the two criteria, Expected Goals from all shots and Expected Goals from on-target shots by the number of goals conceded. A value >100% means that the team is outperforming the model, a value below that means the team is underperforming compared to the model’s prediction. Neuer looks quite superb here already; even in the classic goalkeeping style, he is probably the best. Michael Caley called Neuer’s values “extreme” and has only known of one other, De Gea, who also surpassed the values but not nearly as much as Neuer. This season, Neuer is outperforming the model by almost 200 percentage points. Expected Goals / NPGA per season; Schalke and Bayern with and without Neuer. However, Sander Ijtsma of 11tegen11 is right at the end of his critical article linked earlier: Goalkeepers should not (only) be judged according to their saves percentage. What is their overall impact? Do they save the ball securely? Do they allow few goalscoring opportunities? How do they marshal their defense? What does their positioning look like? How do they affect their front men? The Goal Impact, designed by Jörg Seidel, is a statistical technique to evaluate a player’s impact on the performance of his team beyond the bottom-up approaches and classical statistics. A detailed explanation of how this works can be found here . In principle, the Goal Impact indicates how much a single player changes the goal differential of a team on average. Once the player enters and as long as he is on the pitch, the changes on the goal differential of the team will be recorded. If he is on the bench or subbed on or off, then his previous Goal Impact is compared with the Goal Impact without him and using a formula his influence on the goal differential is calculated. The average Goal Impact of all players is 100. The best players in the world have a Goal Impact of about 190. The idea behind it is derived from the complexity of football; the scorer may only have a small share in the build-up before the goal and ultimately in the victory of his team – maybe, the man of the match was the No 6 as he constantly intercepted passes that stabilised the defense and provided the basis for attacks. The objective of Goal Impact is to find out the influence of a player without referring to isolated statistics such as pass success rates or ball contacts (or goals and assists). The algorithm also filters out the influence of the teammates and the opponents, as well as many other factors such as minutes played, home advantage and level of exhaustion (with substitute players). After numerous tests, we at Spielverlagerung are confident that this method is useful even if it is imperfect. We are even more critical when it comes to goalkeepers, but overall Goal Impact works quite well here, too – and Neuer comes out on top. 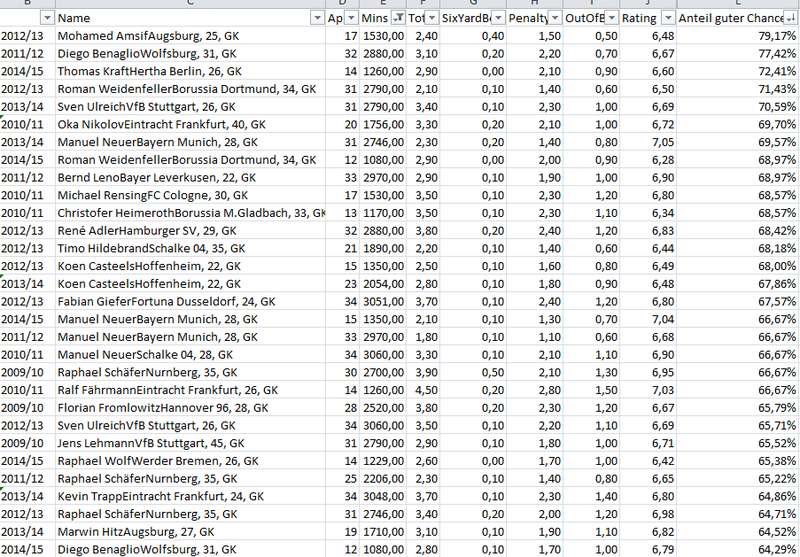 Calculating the latest Goal Impact, Neuer is the only goalkeeper with a value of over 200 at the top. His Peak Goal Impact is at 204.38, which is also clearly higher than the other keepers below him; among them are five well-known goalkeepers with Casillas (197), Valdes (193), Cech (187), Buffon (185) and Reina (173). Of the next generation, Courtois with 171 and Timo Horn with 165 come closest. Even with respect to historical values Neuer is alone at the top. Among the goalkeepers in the past, only Edwin van der Sar, Ronald Waterreus, and Oliver Kahn can compete in the leading group above 170 currently. Behind them are Canizares, Lehman and Dida. Unfortunately, with Lev Yashin and Co. a few great goalkeepers are missing mostly due to a lack of statistical data like number of minutes played. From 160 downwards, it’s somewhat more congested. Here we can find goalkeeping God Stefan Klos (148), Bruce Grobbellaar (156), David de Gea (146), Uli Stein (156), Sepp Maier (145), as well as some young goalkeepers, and many recognizable names along with some rather unfamiliar ones (such as Hernán Cristante, Sergio Bernal or Ulrich Ramé). To put these numbers into context with bottom-up statistics, I have obtained the pass success rates over several seasons for a variety of goalkeepers in Europe. More specifically, the best goalkeepers in Europe: especially like the ones with strong technique, and / or playing in possession based teams, and some particularly famous names. For Neuer, six seasons were used including his Schalke days – although the latter would be significantly weaker. Again, to standardize the values I have converted them into Z-scores. Neuer’s values, over the six seasons, are all above average. It’s interesting that most goalkeepers are below average, because Neuer, Buffon, Bravo and ter Stegen push the average upward so much. Szczesny, Valdes and Sommer also help. So most goalkeepers are below average in most seasons; which makes Neuer’s percentages in his Schalke stint all the more impressive. 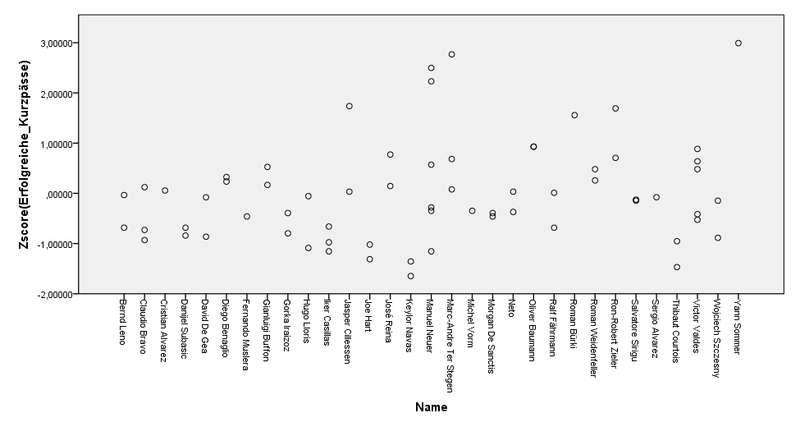 The Bayern-Neuer provides the two highest values in the data set. Ter Stegen’s value – which is equally as good – comes from the smallest sample size in the data set by far, namely his current Champions League season, because of the lack of appearances in the league. Therefore, this value must be treated with caution. But there is a small problem with these values. Upon examination of the data, I have found that many goalkeepers are subjected to significant fluctuations of their percentages of successful short passes; no one is significantly different over more than one season and in general the values are not reliable. Some goalkeepers swing between 93% and 100% for no apparent reason but not a single goalkeeper is below 90%. Furthermore, it is surprising that there is a negative correlation between the team’s possession percentage and the goalkeeper’s short passes success rate – which doesn’t make sense. After some research I found the culprit: Data collection and the definition of short passes. “Short Passes” are passes up to 22.86 meters. Proactive goalkeepers, who are mostly playing in high percentage possession teams often play a lot of 10 to 22.86 meters passes, which are more difficult and more likely to be intercepted or to simply clear the ball out of of bounds. Other goalkeepers only play simple sidewards passes to free players which gives them a better pass success rate. Instead of short pass success rates, I opted for two other complementary statistics.The first is the total number of successful short passes per 90 minutes transformed into Z-scores. Sommer, ter Stegen, Cillessen, and Neuer top the chart., The value is apparently valid at least. 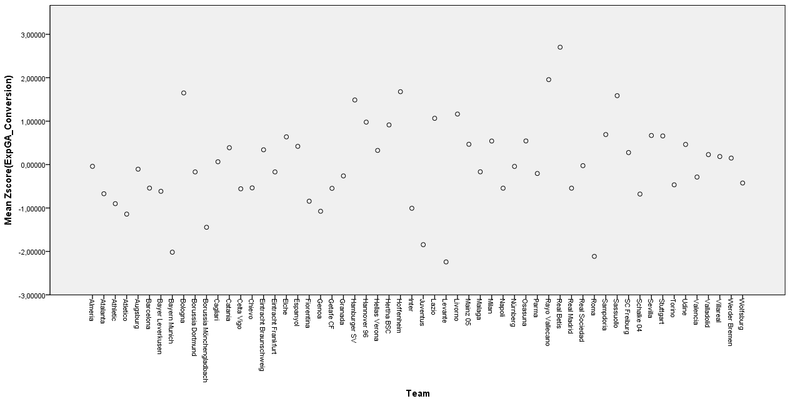 However, it’s interesting that the highest correlation with the possession percentage of the team (and quality as subjectively perceived by the author) turned out to prevail for the long pass accuracy, even if that value is partly due to the well-functioning building structures of a team. Two of Neuer’s seasons are in the top 4. The competitors are once again goalkeeper God Gianluigi Buffon and ter Stegen’s 2014/2015 Champions League sample. It is impressive that Neuer’s Schalke seasons are so high up as well. According to WhoScored, Neuer is the only goalkeeper besides Szczesny, who over his entire career had a long pass accuracy of more than 50%. Not even Buffon and ter Stegen can measure up to that. So, Neuer is outstanding in all statistics relating to goalkeeping. We can assume with a clear conscience that in all these statistics, Neuer’s values are not only because of Bayern Munich because even with Schalke, he’s already producing impressive results. Moreover, his outstanding participation in the game, his support for his defenders, his very good communication with his front men, the offensive strengths of his style of play and his willingness to come out of his box when needed, all add to Neuer’s overall contributions for his team. Of course thanks to the great Expected Goals values provided by Michael Caley, Neuer’s superb results suggest his absurdly strong skills as a goalkeeper. But beware – when considering these aspects, the Neuer X-factor emerges again. In the 1990s, many goalkeepers wore gaudy and colorful shirts in order to confuse strikers – supposedly that was the prevailing opinion many sports psychologists held back then. Of course, the basic idea behind that was to negatively influence the striker’s perception and to interact with subconscious processes. Neuer doesn’t need that because he does it in a more subtle way, by changing his momentum while coming out of his box. For a striker there’s nothing more psychologically inconvenient than a goalkeeper coming out of his box at high speed, leaving the striker no chance to control the ball and prepare for a shot one last time. In some situations, finishing directly is better and easier, but Neuer’s timing in coming out is perfect. He comes out top speed when the striker is just receiving the ball, or when he turns towards the goal after receiving the ball or even shortly before that. It comes as a surprise for anyone if a 1.90m giant comes running all of a sudden towards you, and it is very tempting to rush into things against an opponent who has the advantage in this situation. On the other hand, if a striker approaches him in a longer run and Neuer can’t act fast and unexpectedly right in the beginning, he can come out more slowly. In these kinds of 1-on-1 situations, he often waits patiently for the opponent to take action. With great positioning, keeping the distance from the opponent, and numerous small steps, he closes the dynamic angle very well while the opponent moves and with his long and extremely fast arms he also covers an enormous range. The one game where Neuer was used well. As a result, he can keep his position very long and delay the shot, while creating psychological (decision-making becomes difficult), motoric (angles and gaps are closed down), and tactical problems (Neuer’s defenders can catch up and press backwards) for the opponent. Switching between ultra-aggressive and highly dynamic runs and patiently waiting just outside the six-yard-box together with Neuer’s wingspan, makes him an obstacle in 1-on-1 situations that is difficult to overcome. In addition to this dynamic pressure, he is outstanding at maximizing his body surface area. Neuer is very adept at stretching himself, he usually shapes an arm like an “L” thus closing gaps around himself. Mostly, it is the arm that is closer to the post. Neuer often positions himself close to the post, leaving only a small space open. To capitalize on that, a shooter would have to finish very precisely; in a suitable situation, he can use either his left foot when attacking from inside left or his right foot when attacking from inside right, or in an extremely difficult manner using the “wrong” foot. His positioning enables Neuer to defend the near post with an arm while slightly tilting his body towards the open corner by the far post and using his other arm to secure the space below his neck. Combined with his long legs and agility, the entire range of shooting options available is more or less covered. At times, to reduce the likelihood of a successful strike he increases the dynamics and abruptly closes down an opponent using absurd movements, such as a very fast and chaotic fanning of his long arms, or jumping towards the ball carrier like a handball goalkeeper, or slide-tackling with both legs. In any case, his physique is perfect for his style of play in almost every respect. In contrast to the many muscular followers of Gerry Ehrmann School, Neuer is rather lanky despite his size. He is very fit, but far from a beefcake. Compared to Tim Wiese in his earlier days, Neuer’s legs are probably trained more but his torso is not as extremely broad. As a result, he carries no unnecessary weight; in training he probably concentrates on highly explosive and intense exercises. He is very dynamic and powerful not only in sprints but also in all other movements. This is not only useful in coming out but also with reflexes. Neuer has excellent jumping power, regardless of the direction. Basically, like most goalkeepers he can jump off extremely fast with his outside leg – for example, with the left leg when faced with shots into the left corner. But when faced with high crosses, Neuer can jump high with the inside leg, too. Faced with crosses into the penalty box, he can jump towards the right side with his left leg and remain in the air to catch it. If he doesn’t jump straight upward, but diagonally to the side, he’s even able to vary or mix these movements well. In any case, the interception of crosses is a prime example of Neuer’s development and his style of play. In his earlier days, they were a problem sometimes because he came out in an exaggerated manner, the timing was sometimes off, and he couldn’t always avoid individual collisions with teammates or opponents in midair. He has massively improved this over the years, but it can still be one of Neuer’s weakest areas – and yet, it is not a particular weakness. Today, he no longer comes out of goal in such an agitated and exaggerated manner as in his 2nd season at Schalke. He is more restrained and relies more on his teammates in cases when the chances of successfully intercepting a cross or when the opponent finishing successfully are low. Neuer has learned to assess those probabilities and that makes him very reliable in dealing with crosses. The goal by Sam in the game against Leverkusen last seasonis a good example. Neuer came out make or break, because the cross was close to him and it presented the opponent with a very good opportunity for finishing. Even an insecure redirection of the cross is better than allowing a free header for the opponent – Neuer was unlucky in that situation that Leverkusen still managed to convert. Many of these crosses that Neuer catches or redirects don’t end up in a goal, but sometimes he doesn’t look good at it. Neuer’s Heatmaps this season. Some Chelsea defenders in their CL run 2011/12 had more defensive heatmaps. A few nice foray here and there for a goalkeeper. If Neuer comes out faced with crosses close to him, he usually gets them. If he flies past them, he usually deflects the trajectory or changes the opponent’s perception. Otherwise he stays on the line, moves along with the ball with small steps in a half-circle, and is able to clear many of the subsequent headers. Thus, even in one of his weakest areas, he still makes a positive impact. On the line, however, he’s one of the best in the world. What impresses me, as a Bayern fan, about Neuer is his enormous control of his entire goal. He can dive low extremely quickly and thanks to his explosiveness and height he can reach shots at the corner of the goal even when the shooter finishes from a really close position. For that, Neuer uses a wide base position. Compared to other goalkeepers, he stands broader and his feet are more than hip-width apart. What are the benefits of such a position? Due to the wider base, Neuer can avoid any intermediate steps. He does not need to approach closer to a corner because he can jump powerfully and directly with his position, nor does he need another step to jump farther. Theoretically, this elaborate style can be punished with either a sharp and flat direct shots between legsafter a switching play, or a very sharp diagonal shot to the top corners of the goal; although with Neuer’s long arms, quick reaction and aforementioned arm positioning counteract these possibilities. This basic position benefits Neuer with his excellent jumping power and rather lanky torso. In addition to increasing his explosiveness and extending his reach, this position gives him time before making a decision. Since he doesn’t need to take additional steps, he can extend his jump longer and even react while in midair. Sometimes he can even wait and delay the jump to observe the trajectory of the ball. Often though, he instinctively jumps early and subsequently capitalises on it. Neuer is able to catch many of the balls other goalkeepers can only clear with one hand or fist at the expense of a corner kick or into the pitch. This is of course beneficial to the team, because Neuer rarely allows for subsequent finishing attempts or follow-up attacks. It’s also noticeable that Neuer can secure or clear even extremely difficult balls when faced with waist-high crosses or shots into a corner. By contrast, when it comes to fast saves close to the body or sharp shots above his head, he can’t avoid disproportionately often clearing the ball for a corner kick or throw-in like any other goalkeeper. His jumping technique explains this. What is important for Neuer’s jumping style is the correct positioning during all phases and the clean execution in special cases. Standing on both legs is essential and Neuer maintains this position very well using numerous small steps when switching sides. With shots close to his body but not in the immediate reach of his hands, Neuer often simply falls over to the side to block the ball. He doesn’t jump in this case or only jumps when he’s about to fall over. Neuer also uses that technique in another situation. For (almost) every keeper, there is an unpleasant situation from a motoric perspective: flat and sharp shots just outside the reach of the leg that is close to the ball. In these situations, he cannot jump quickly enough with the outside leg, nor can he reach the ball on the ground with his hand – to that end, he would have to shift his torso like an arch or perform a very fast slide-tackle to get to the ball. Physically, that is somewhere between impossible and too slow. Many goals conceded in such situations are (wrongly) blamed on weak goalkeeping, but almost every goalkeeper has this little problem with shots from just outside the goal. This is almost symbolic of Neuer’s goalkeeping technique: it is unorthodox but very effective and cleanly executed. Whether it’s encroaching, clearing the ball with his fists or redirecting the ball – it all seems a bit strange and almost as if borrowed from another sport, like volleyball or handball, but it works. No matter what technique is considered, Neuer has his own way of goalkeeping. For example, after his forays outside the box, he often sprints back and when the situation calls for it, acts extremely conservative and remains close to the line. Neuer is cautious that his position close to the line doesn’t turn into a weakness. If necessary, he saves shots with his legs, and if the ball rebounds back into play, he immediately springs to his feet and blocks available spaces for a shot. 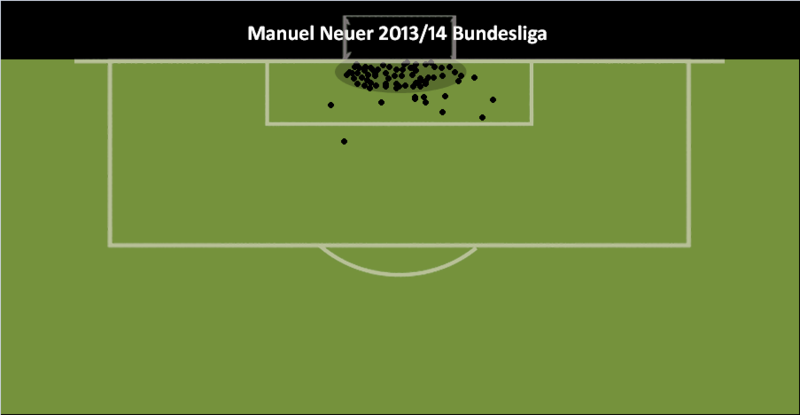 Usually, though, the rebounds go to the side or remain near the line, and Neuer can collect many of them directly. His body is already ready, he can face even sharp shots very well, and keep his body stable during the jump, which is unusual for many goalkeepers. His technique gives him advantage when faced with sharp shots into the corner in particular. Neuer’s powerful leap gets him quickly and far to the side, he jumps from a very low position (achieved by bending his knees and standing wide) and moves diagonally upward. He keeps his hip comparably high, his torso is stable, and he spreads his arms so he can catch any ball from below. Depending on the sharpness of the shot, he can react well to rebounds and if he misjudges the shot, he can at least stop the ball with his hands instead of steering it forward. In general, he can defuse many sharp shots instead of just letting them bounce against his body. Equally as impressive are his positional play when intercepting crosses outside the box, the associated positive effect on the positional play of his front men, the improved interception of diagonal back passes, as well as his choices where to stand and when to come out to the side in the case of a corner kick. That’s why it’s almost a shame that sometimes, Neuer is reduced to his skills outside the box. Because that is not the only reason Neuer is the best goalkeeper in the world. The question, “Is Neuer the best classical goalkeeper in the world?” can be answered with a “yes” without being completely wrong especially if the statistics cited earlier are taken into consideration. Nevertheless, of course, the emphasis should be on his strengths that are rare in world football – and that should be integrated accordingly. It couldn’t be said any better. Neuer has mastered the ability to completely control the entire first third of the pitch by himself and he is slowly orienting himself little by little towards the center line. Whether his forays outside the box would extend all the way to the center line more frequently and he’ll still perform solidly might be the most exciting question in Bayern’s current autumn campaign. Considering Bayern’s extremely good counter pressing and high position when in possession, he can theoretically shift his position some meters farther outside his box. Losing control of the wing areas and the tracking back quickly that‘s needed when faced with diagonal breaks can be (as of yet?) what deters it. But maybe Neuer can be involved more when Bayern is in possession. Especially once the opponent retreats and sits deep into their own box and > 80% of Bayern’s field players are camping in the opponents half, Neuer is barely involved anymore. With sad eyes, he stands in a vacuum between the halfway line and the edge of the penalty box looking like he wants to join the play; why don’t they let him? A more advanced positioning for Neuer would allow broader situational formation of the central defenders. As a result, the No.6 (the defensive midfielder like Alonso) would no longer need to drop deep frequently because the resulting diamond consisting of Neuer, two central defenders, and another (possibly interchangeable) player in the No.6 space offers many passing options and each point of the diamond can be a base for initiating or creating plays. Thus, Bayern would have an additional man available during build-up after back passes and the slightly higher positioned No.6 in center midfield can help during the early press to prevent the opponent from creating a chance and ensuring the open running paths for the opponent’s No.6 and no.10 spaces can’t be exploited. However if the opponent comes out pressing aggressively, they still have a long way to go to get to Neuer. His long balls or flat vertical passes into open spaces will be a weapon in these circumstances. Granted, Neuer’s even more advanced position might hardly change anything offensively or even reduce Bayern’s defensive stability – or maybe not. Increasing the intensity of the counter pressing even more can probably (over)compensate for Neuer’s higher defensive position and while in possession, Bayern can exert even more presence in the opponent’s half. We’ve often seen the triple chain in build-up play this year which allows for certain interesting and as of yet unseen moves. A diamondformation with Neuer in the defensive half-space, a wide half-back near the sideline, a centerback as a second central vertex, and a retreating offensive player – like an advancing No. 6 or No.8 or a wing-back moving centrally – as the diamond’s highest point would be worth seeing from a tactical point of view. The goal would be wide open but it could hardly be attacked directly because of the high turnovers to be expected in the wings with 4 Bayern players ready to get the ball back (if Bayern ever lose possession). In addition, the wide position of the half-back would allow interesting combinations in positional play while ensuring a way to get rid of the opponent’s imminent pressure by passing backward. The over- and underloading patterns available would also be interesting. In this situation Alaba is actually a half-back (early term for midfielders, a player between the offensive and defensive line), but according to his role (which will be examined in another article) he can also move up diagonally or use the spaces opened up by Bernat, and he has the opportunity for an overlap run in open spaces for him or Bernat. Bernat, in turn, can move inward and has an interesting field of vision of the other side,where he can very well and easily involve Thiago, Schweinsteiger, Lahm, or Boateng with diagonal passes with his left foot. Ribéry and Götze have opened spaces for Bernat so he can speed up when needed and push forward. Schweinsteiger’s movement into spaces is tempting for Götze to drop deep and switch sides, involving Thiago as an additional “needle player” (a creative playmaker who can dribble through tight spaces) in that area, as well as Robben and Müller who are moving forward and inward. When Ribery drops deep in midfield, he is supported by Götze and Bernat. In general, the opponent is going to be preoccupied with the switching positions and confusion is created in the areas of responsibility, a situation Neuer can use flexibly with whoever occupies the top point in the diamond structure. Alaba and Boateng play as two very wide centre-backs; thanks to Neuer the center forwards can’t pressure them effectively. After the opponent has been lured into relocating pressure to another area, in situations like that in particular, they can move forward. Neuer’s deep position is high but away from pressure by the opponent. The wide position of the central defenders is great support for Neuer because the opponent’s center forwards find it extremely difficult to press. 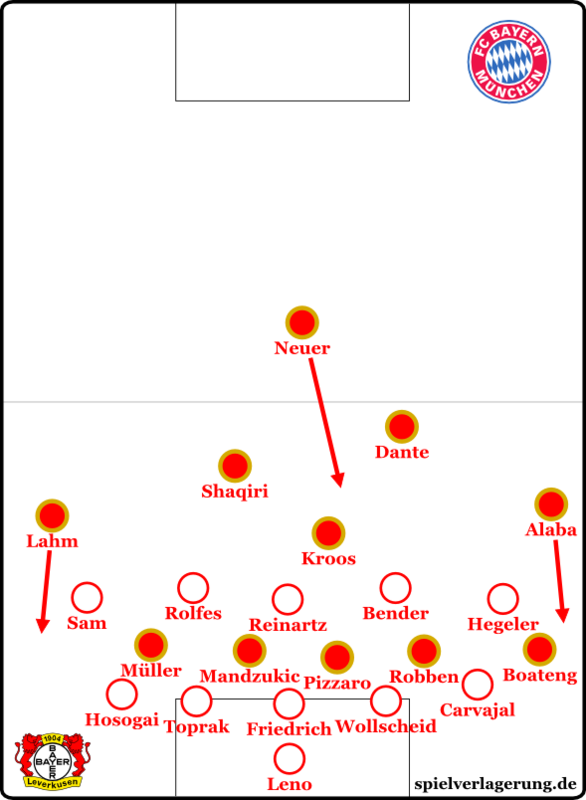 Lahm and Bernat can situationally drop back in order to offer themselves as open men, and then the central defenders can move inward opening spaces and drawing in the opponent. In addition, the full-backs push towards the middle frequently to support the No.6s and the wingers. Neuer can then either directly pass to Robben or Ribery behind the central defenders, or involve them by passing to the half-back. Especially with Robben on the right side and with Neuer being right-footed, this is very convenient. The No. 6s have a lot of space to move, same as the two center-forwards. Neuer’s high position and the resulting 3-4-4 enable flexibility in midfield with two wingers in both sides and the square in the middle. As the picture shows, I have created the image mindful of Guardiola’s positional play with respect to occupying the passing lanes, opening spaces, involving third players into the passing game, etc., etc. As a Christmas gift to the English version of our site, an in-depth article on “El Juego de Posición” will probably be published. Application of such tactics would be beautiful to watch – at least for the tactics nerds. If it works (and a genius like Guardiola should be able to find various unimaginable ways to make it work), Bayern would be able to play even more spectacularly. If not, then the league might become more exciting again. A win-win situation for everyone, right? Oh well, and at least once you could even field Neuer as an outfield player, right? A double No.8 with Reina and Neuer, that would be something. False 9, centre-back, halfback or sole No.6 would be acceptable, too. Okay, I’m exaggerating. Conclusion: Neuer worthy of the Ballon d’Or? Last year there was an in-depth analysis about Cristiano Ronaldo on Christmas Day, two years ago I published one about Lionel Messi in October. Now, these two are the two remaining competitors of Manuel Neuer in the World Player award. Abroad, though, criticism has often been brought up against Neuer’s nomination. It’s been said that it is just a pseudo-nomination that has been included on the principle of having a player of the World Cup winning team amongst the top three. Malicious tongues in this country, by contrast, have asserted that if anything both Messi and Cristiano Ronaldo should have made way for Lahm and Schweinsteiger and Müller, and the former two are only still at the top because of their status and goal statistics. How much can a goalkeeper do in a 6:0 win against? Ah, so much. Regardless of these opinions, however, one point in all these discussions caught my eye – namely the refusal to nominate a goalkeeper as World Best Footballer, because a goalkeeper supposedly can never have the same impact on the game as an outfield player. Could that point stand if a team play without a goalkeeper? This is obviously a very polemic argument, but the above mentioned simplification is equally as polemic. One could even say that Neuer’s historical merit is to have freed the goalkeeper position from this stigma. Goalkeepers in the past actually only played a role in specific situations. Of course, in those situations they were very important, but there were only marginal differences separating them from their competitors. Over a whole season, the difference between an extremely good goalkeeper and a very good goalkeeper probably is inconsequential, as long as the team plays the same style. At least that is reasonable to assume when it comes to the top teams. With Neuer though, it’s simply tremendously difficult to find a comparable goalkeeper in the history of football. There have been many proactive or anticipative goalkeepers. But who was able to participate at such a high level and shield a defense that is so far up into the opponent’s half at such a demanding level? Many such goalkeepers have been forgotten in the history of football. Depending on the source, Lev Yashin, Gyula Grosics, Jan Jongbloed, Amadeo Carrizo, Gert Bals, Heinz Stuy, Tommy Lawrence, Franjo Glasner, Ladislao Mazurkiewicz, and Harry Gregg are credited as the prototype of the modern type goalkeeper. The first four names in particular are mentioned frequently, but only Carrizo and Yashin were really good with the ball at their feet and at the same time active outside the box. Many other goalkeepers were forgotten: Petar Radenkovic was already as complete as a modern goalkeeper in the sixties and an absolute genius, Sepp Maier is probably as underrated in this respect as his East German counterpart Jürgen Croy, and Willibald Kress was completely forgotten. Is this a consequence of the scarce coverage and low-level globalisation before the 1970s? Joseph-Antoine Bell, Fabien Barthez, Harald Schumacher (who was very convincing when coming out – except against Battiston – and with his throws), BVB legend Stefan Klos, numerous South American goalkeeper (Oscar Cordoba, Jorge Campos, Jose-Luis Chilavert), Jens Lehmann, Stanley Menzo and Bruce Grobbelaar are misgauged in today’s standards too. It is significant that in fact only two goalkeepers are still collectively remembered today: René Higuita and Edwin van der Sar. The latter because of his success with Ajax and United, the former not because of his record ongoals conceded with Colombia in the early 90s, but because of a failed dribbling at the 1990 World Cup (although everyone knows it was just the wrong formation). The brilliant and very complete Buffon – in my opinion, the only modern goalkeeper on par with Neuer apart from van der Sar – for example, is misjudged as well. His involvement in the game despite his outstanding strengths in all aspects has never been as focused as Neuer’s,which suggests an important and deeper problem. Although it’s becoming more and more important for a modern goalkeeper to be technically superior, from a tactical perspective, the “goalkeeper libero” hasn’t really caught on though. Presumably because involving the goalkeeper is considered risky and difficult, and the constructive build-up gameas a tactical and strategic means is still misunderstood even today. Neuer’s performances, especially in the World Cup game against Algeria, could motivate rethinking. While many are still skeptical, in the end the positive effects when playing with and against the ball is hard to contest. For that reason alone, Neuer is kind of a role model and his nomination for the World Player of the Year is unique. He has widened the influence of the goalkeeper to encompass the entire gameplay and he is as present as only a handful of goalkeepers before him. It is with very good reason that the 2014 World Cup was the first time in the tournament’s history where the keeper of the winning team had more successful passes in the whole tournament than the outfield player who was crowned the Best Player in the World Cup. Did Neuer really have less impact on his team’s gameplay, at least at this World Cup and the outcome, than many outfield players, including his two competitors for the World Footballer award? In addition, when comparing offensive and defensive players by counting successful actions, a bias is created: If Messi and Ronaldo succeed, it records as a goal; if Neuer succeeds, it records as no goal. 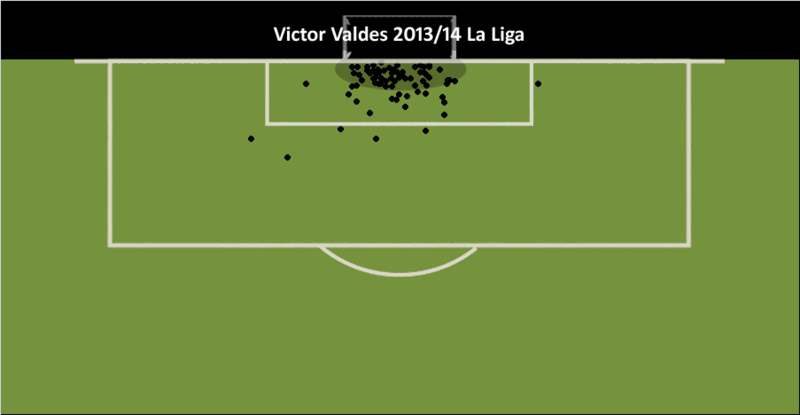 However, that doesn’t mean he has less impact on the goal differential, which in the end is crucial. According to the Expected Goals statistics cited above, Neuer’s saves alone amounted to 27 goals above average within 3 ½ seasons. His other actions should have an even greater impact considering their much higher quantity. These effects are not only underestimated, but very often simply overlooked. But a prevented goal happens to be just as valuable as a goal scored, maybe even more, depending on the situation. Furthermore, one could choose players according to their superiority in their own position or role compared to their competitors. Here is a simple example by Benjamin Morris at Sceptical Sports: If you need a scorer in an All-time NBA draft, you will naturally select Michael Jordan. But Durant and Co. are near Jordan in that respect – by contrast, not a single power forward is as strong defensively and with rebounds as Rodman. But Rodman isn’t the best NBA player by a long shot, yet in a particular setup, he could be the most valuable player in history and as such, a bizarre but absolutely rightful first pick (this example and more about this thesis and Rodman’s peculiar special prowess can be found in this series, which is an incredibly worthwhile reading). Applied to football, this would mean that while you can always find powerful offensive players (Cristiano, Messi, Robben, Suarez, Müller, Aguero, etc., etc. ), there’s only one goalkeeper like Neuer, who is so extremely intelligent in supporting the build-up game and allows for such an aggressive pressing strategy. The argument is not quite as clean and accurate as in the linked article about Rodman, but generally corresponds to an interesting way of thinking and together with the Goal Impact values it may be sensible notion concerning Neuer. Alternatively, one could proceed as simply as that: Compare the quality and performance of a player. Over the entire year, Neuer was almost flawless, consistently played at an extremely high level in a tactically complex individual role within a tactically complex team tactics and has excelled in almost every respect: as a goalkeeper on the line, as the 11th outfield player participating in the game, and as a defender far from his goal. At times, even his decision making, his communication when passing and his header technique could be described as world class irrespective of the position he plays. Seven years ago Neuer made the most impressive and psychologically demoralising save ever, as well showing the most spectacular individual performance of a goalkeeper outside the penalty area in a World Cup since Higuita. What has changed, of course, is what is asked of the man between the posts. For many observers, Manuel Neuer is now the role model of the “catching field player”. Every second he must be able to receive any ball, take it with him and play it back to a teammate. That is how Oliver Reck has defined the basics of the Schalke goalkeeper school. Neuer is so good at it that Reck would trust him as an outfield player in the third division which he illustrated with a little anecdote: When the still unknown Neuer once played outfield in training, excited spectators came running and asked them who this great new player was. In an emergency Neuer is always capable to play a clever pass. His long throws are even more effective, once a speciality of Toni Schumacher, who developed them with the former javelin thrower Rolf Herring. Neuer is a legitimate heir to Schumacher in that respect: The other day against Hertha BSC he threw the ball more than 60 meters to striker Peter Lovenkrands, initiating the decisive scene of the game. To practice this tactical device, Lothar Matuschak in the youth team had built up three small goals at the center line. “We still practice that every week,” said Neuer. With his goalkeeper coach Toni Tapalovic whom he brought with him from Schalke, Neuer practices an even more entertaining exercise that I found almost as spectacular as the legendary warm-up routines of Alves and Messi, Maradona or Ronaldinho. About fifteen minutes before everyone else, Neuer comes out with three coaches and the four of them occupied the entire half alone. One of the coaches stands at the corner flag, the other on the opposite side at the sideline, and the last one positions himself at the center circle. The procedure is as follows: From the corner flag a cross comes which Neuer directly intercepts. The coach on the sideline slightly moves up and down, Neuer drops the ball and plays a long pass towards that coach. The coach then plays a high pass back, Neuer catches the cross and immediately throws the ball 50 meters to the coach at the center line. They practiced this little game for fifteen minutes and Neuer didn’t even make one mistake: That is, not a single technical goalkeeping error in catches, not a single unclean long ball and not a single inaccurate throw. Can Cristiano and Messi do that, too? Neuer’s perhaps most telling scene: taking a penalty versus Cech, 2012. A leader par excellence. Since this Neuer article has about 13815 words, the goalkeeper position has been recognized in the advent calendar with the most words among all position-specific articles in this site. Take that, smart and casual No.6s and full-backs. A big thank you to Martin Rafelt (MR) Constantin Eckner (CE), Tim Rieke (TR) and especially goalkeeper technique expert Tobias Robl (RT). A huge thank you to Paul Riley , Michael Caley and Joerg Seidel, who, by making their great statistics and data freely available for me, allowed me to write the article in the first place and supporting my observations and hypotheses with valuable numbers. This article has been translated by RedQueen. Edited by runaway. Additional proofreading by champagne_mami. Big thanks from the Spielverlagerung’s crew! This is by far the best Neuer analysis I’ve seen, and great translation btw! I’ve followed his every single match either on TV or in the Stadium since 2010, and this article is the most convincing on his talents and techniques, and it’s statistically accurate. He is not only my favorite football player, but also the man that I admire and appreciate the most, because he always understands the game, and he makes the best decisions under pressure. People, especially the ones started watching him since the Brazil World Cup, always think of him as too bald to be confident and always anticipating his failure. These people need to read this article badly to get rid of the bias. I basically agree with everything the author wrote. Bravo! Excellent article really broadened my perspective. This is probably the best article I have read on your website and I have since spent the whole day reading tactical analysis of various matches and formations on the website. This website is a notch above most if not all the other websites I have encountered with respect to tactical analysis. Thank you for the English translation . Thanks for translating. Fantastic article. Enjoyed every word.